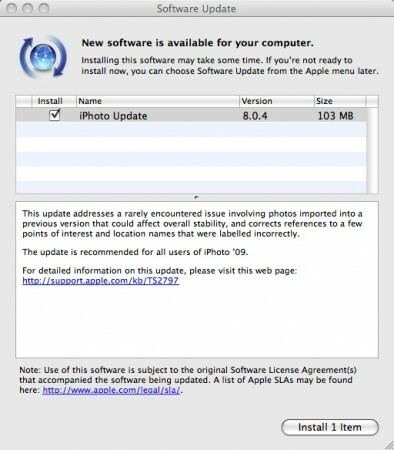 Apple released iPhoto update 8.0.4. This update “addresses a rarely encountered issue involving photos imported into a previous version that could affect overall stability, and corrects references to a few points of interest and location names that were labeled incorrectly. It’s recommended for all users of iPhoto ’09”. You can download the update using Apple Software Update or download from Apple’s site.